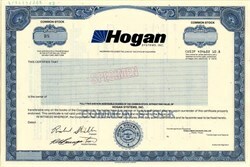 Beautiful engraved specimen certificate from the Hogan Systems, Inc dated in 1982. This historic document was printed by American Bank Note Company and has an ornate border around it with a vignette of the company logo. This item has the printed signatures of the Company's President and Secretary and is over 25 years old. Hogan Systems, Inc. develops, market and supports integrated on-line applications software and related services in use by more than 130 financial institutions in 20 countries. The company provides sales and support from offices in Australia, United Kingdom, and German as well as its Dallas, Texas headquarters.